...... You can adjust the volume and pan of each drum sample to create awesome stereo mixes. Your entire drum track can be exported to a standard WAV file or MIDI file for playback in an audio player, or for import into a multi-track recording software package. * Create professional drum tracks using your computer. Your song is exported to standard WAV file for use in other programs, such as multi-track recording software or CD burning applications. * Export the drum tracks to MIDI file format 0 or format 1. * Use the included drum sounds, or import just about any WAV sample file for your drum kit. * Humanization features add slight velocity and timing offsets to the final WAV mixdown, to sound more human and less mechanical. * Design patterns visually or interactively in real time. 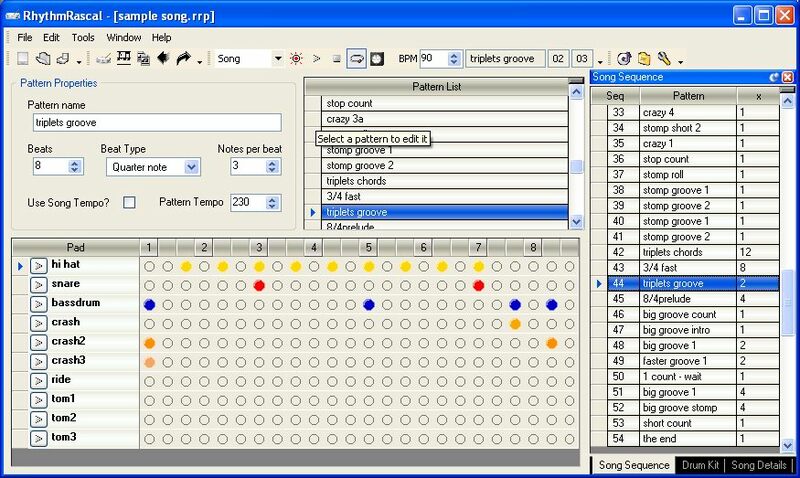 * Metronome for real time pattern recording. * Odd time signatures are supported. STDL Biorhythms helps you to calculate your biorhythms. Qweas is providing links to Rhythm Rascal 3.2 as a courtesy, and makes no representations regarding Rhythm Rascal or any other applications or any information related thereto. Any questions, complaints or claims regarding this application Rhythm Rascal 3.2 must be directed to the appropriate software vendor. You may click the publisher link of Rhythm Rascal on the top of this page to get more details about the vendor.